When There’s Trouble, You Know Who to Call! Lately, I have been binge-watching one of my favorite shows from when I was kid, the original Teen Titans. I would wake up every Saturday morning to watch all of the Kids WB cartoons, such as Animaniacs, Tiny Toons, Pokémon, Yu-Gi-Oh!, and more! But Teen Titans took the top of my favorite-TV-shows-list for a number of years. Since then, I have become really interested in DC Comics, particularly The New 52, the latest reboot for the entire franchise that was launched in 2011. DC Comics is extremely fortunate to have some of the best writers and artists in the business, such as Geoff Johns, Scott Snyder, Grant Morrison, Peter Tomasi, Jim Lee, and more. Some of my personal favorite comic lines have been Green Lantern, Aquaman, Batman, Justice League, and Justice League Dark. All of this can seem overwhelming to non-avid comicbook readers, and rightfully so. The timeline for DC Comics goes all the way back to the Golden Age, but they are able to justify this and all the discontinuities by including major comic events that crossover all the current lines. The first major DC Universe (DCU) crossover was Crisis on Infinite Earths, which notoriously killed off failing comic lines and rebooted others through this inter-dimensional, worlds-destroying (yes, plural) event. There have been several more through the years, the latest being Flashpoint, which kick-started The New 52 reboot. These reboots and multidimensional characters and worlds are enough to confuse anyone who tries to jump in. I know I am still confused on several things which is why I try to stick to The New 52. But over the past few years, DC has been releasing annuals in a series known as Earth One (EO). This series is an excellent way for new comic readers and the curious to jump in without having to worry about previous storylines and multiple dimensions. 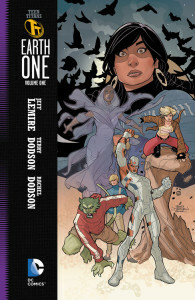 Each volume of Earth One is a complete story with a beginning, middle, and end that does not connect to The New 52 or any other previous storyline. Each Earth One book features a thick, black border to the left, clearly denoting the series. Earlier this year in March, DC Entertainment announced that the next installment of the EO series will be Teen Titans: Earth One Volume 1 (YES!!!) as well as the announcement that EO is planned to move from an annual release to a quarterly release. Teen Titans will feature several memorable characters such as Cyborg, Raven, Beast Boy, and Terra. After 2013, with no EO release, it is great that they are delving deeper into this series. Expect to see more Batman, Superman, and possibly Wonder Woman in 2015. Teen Titans: Earth One Volume 1 will be released November 19, 2014. In the meantime, go to your local comic store, Barnes & Noble, or even a digital comic shop on your tablet or phone and pick up a copy of Batman: EO Volume 1 and Superman: Earth One Volume 1 and 2! Let us know if you are thinking of getting into comics!